Jack’s Loft has been a semi-favorite hangout of beloved and me when we have a bit of money to burn and feel like drinking a lot of iced tea ever since we tried its incarnation on Trinoma. Yesterday, we ate there after a few months of not going. Although this bistro specializes in desserts and alcohol, we love their sharable sandwiches and special iced tea. We also like its location in the mall, which is at the alfresco area on the fourth floor near our tambayan arcade with the cool wind rushing in from the west balcony. They had new stuff in their menu, and, among them, a new kind of sandwich. They’re called presatta, which I imagined to be similar to their grill-pressed panini. 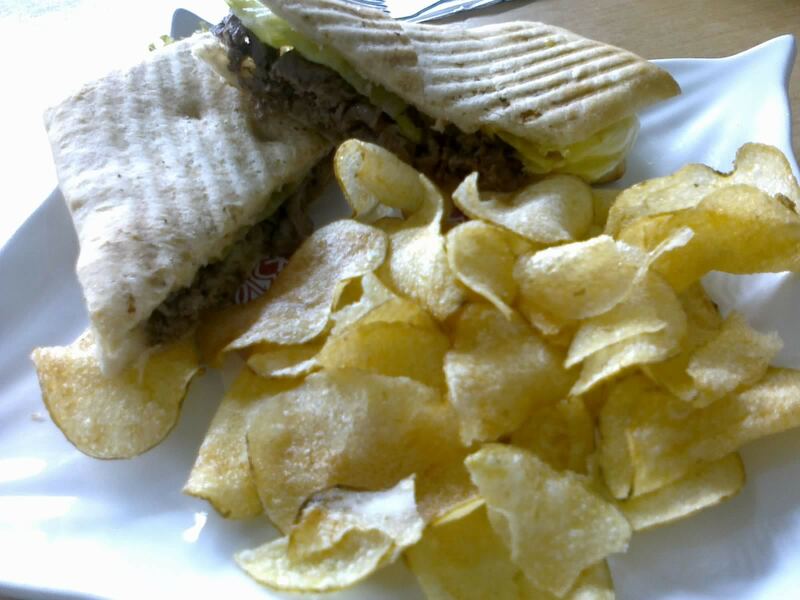 I loved the texture of their panini, so we decided to try it out. We ordered their Wasabi Beef Melt (182 Php) and the usual Fishbowl Iced Tea (112 Php). The Fishbowl Iced Tea came first. It’s basically sweetened iced tea in a very large serving, enough for three people or two thirsty ones, perhaps about a liter of it. 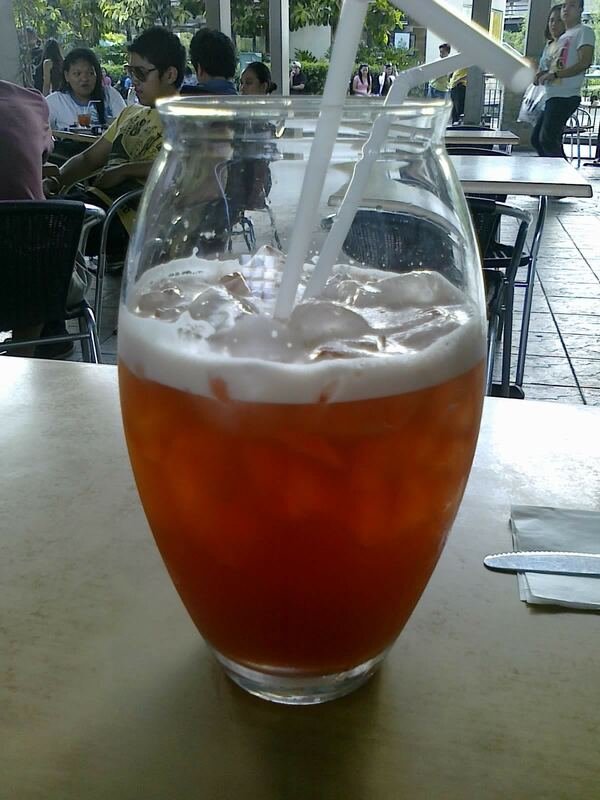 There’s nothing particularly special about this iced tea other than the method of serving, but it’s still somewhat better than your regular iced tea mix, albeit a bit pricey. The presetta came a bit later. I was a bit disappointed in the size. Although it was a decent serving, I found it to be smaller than their panini and other sandwiches. Nevertheless, the texture was awesome. Its flaky, crunchy, tasty, and slightly charred exterior is a treat in itself. The filling was good too. The beef was their usual beef they use in their other sandwiches. Although I find it a bit on the chewy side, it’s still quite filling. The sauce, although labelled wasabi, was also good, although pretty mild. You can taste the wasabi flavor, but it’s not enough to make it steam out your nostrils. The chips are a good complement. Not much in taste, but their crunchy, crispy texture makes up for it. Yes, I do find Jack’s Loft a bit overpriced. It’s still fair, though—150 Php each, since their food is pretty much good for two. All worth it if you’re wanting to relax, a nice place for a date. If you’re going here the first time, I recommend their Steak and Mushroom Gravy sandwich, also good for two. Not recommended for: Very hungry loners. Smart nomnomnom tip: Most of their items are good for two.